Another long week before updating and I apologize. Just so much going on. Did we tell you that Emily loves camping so much that Saturday night we slept in the camper right in our own driveway. She has been asking every night since if we can sleep in the camper. This week has been a nerve racking week with all the scans and preparing for round 3 of chemo. Its been a long week, but Emily is doing well! Monday we had two scans, Emily had her CT scan and bone scan that she had scheduled. Doug and I were so proud of her, so so proud of her. She needed to drink the contrast and the lady said if she couldn't drink the contrast they could put a tube in her nose to get the contrast down and Emily was not about a tube in her nose and drink the contrast down in 1 huge gulp. The lady was shocked. After a half an hour she was on her way to get the CT scan done. She laid there and let them take the picture and she was done. The bone scan was a little longer, so we were worried that she wouldn't be able to sit still, however Emily did great she just complained that her feet hurt and daddy rubbed them for her. But she did great and she did it without any anastesia which was what we wanted. 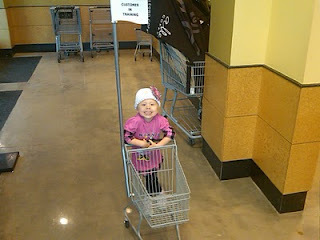 We were very proud of her and she couldn't wait for the scans to be over on Monday, so we could take her to Whole Foods to get some food. The picture is of Emily at Whole Foods so excited to be there to get some food and still on a high of great counts and not needing to wear a mask. 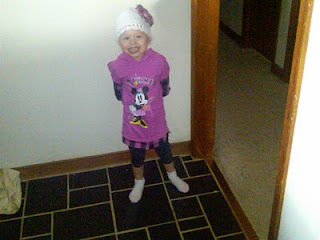 Tuesday she had to get the injection for the MIBG and we received notification that the Bone Marrow came back CLEAN. We were very happy to hear this. VERY HAPPY. We also got the results back on the CT scan that Emily's CT scan done during the first round was 3.4 X 2, and after the 2nd round it was 3.4 X 1.8. So we are making some progress and it is decreasing in size. They indicated that the bone scan came back with the same uptake in the upper legs that we were familiar with before. And to wait for the MIBG to get final results. They also wanted Emily to do a urine sampe to check her catacolomines on Wednesday when she comes in. They checked this previously and her levels were elevated for neuroblastoma markers. Wednesday Emily had her MIBG scan and we knew this scan would take 45 minutes and that Emily wouldn't be able to sit still that long. So, while we didn't want to use the anastesia, we went ahead and let them do it, because we knew she wouldn't sit still. Once it was over, she asked if they were going to take her picture. I told her they did it already, she fell asleep. So we received notification today that the MIBG showed that the lesion that she had in her knee was gone. Um yes, I said KNEE... Doug and I were upset because there was no talk of the knee before and the only thing that was every brought up to us was about the 2 places on both legs that were adjacent to each other. There is still showing the 4 places in her legs, but that the markers aren't as bright on them. He also indicated that the bone scan done back in December showed uptake in her skull and it still showed that uptake from the bone scan she had done on Monday. Again, WHAT? That's right another spot that were not made aware of. Dr. Gowda indicated that the place in the skull only shows in the bone scan and not on the MIBG scan and that it could be nothing. He said that he could be something she was born with, something that happened during the birth canal or something that she hit her head or something. I talked to Doug about this and while we will still move forward with Round 3 which starts Monday, we both feel like we want to get a 2nd opinion on the scans. We were both bothered that we were not made aware of those places and we both felt it was of important information and is there anything else missing that we need to know about. While one would think that maybe we missed them telling us that information during a stressful crazy time, but not both of us would have missed them talking to us about this information, so we know it was not told to us. So, Doug found that we could have our information sent for a second opinion to CHOP, so I think we are going to send them our information and have them check over everything. Today Emily and I also stopped by Diva's and Dudes to see Tiffany. Someone had made some organic cookies for Emily that looked like flowers and put them in a pot. They made Emily smile and they also took a picture of her with them there. Once I get it, I will post it. Emily loves Diva and Dudes and it seems love her too. They do such an amazing job. Emily told Dougie tonight that she really misses her friends at school. That is really the first time that she has ever said that and it really made us both feel bad knowing that she misses them and that she can't go to school. I think we are going to go camping for the weekend or at least one night to get away. Emily starts Round 3 of chemo and we just want her to have some time away from the house and have happy thoughts before heading into the next round. Please say prayers for Emily as we head into a new round with new chemo medicines that we are unsure of and we are nervous about. We are happy to report that she didn't get any mouth sores during Round 2 like she did with Round 1 with using the Traumeel, so our hope is that it continues during Round 3. --Max lost his battle in neuroblastoma, please head over and let his parents know we are thinking about them during this time. http://www.caringbridge.org/visit/maxwellbulman . Has anyone seen this video, "Pray" by Justin Bieber? I ask because for one it hits so close to home and for two, Emily loves this song. She listens to this song only about 50 times a day and each time sings a long. She even watches the video. It is amazing because of the closeness it hits for home. Definitely a second opinion is in order. Emily remains in my prayers as do the rest of your family. I do not personally know you or your family; however, I found your blog on my friend's facebook and have been following Emily's journey ever since. She is always in my prayers. She may be a stranger to me, but she is an inspiration. In all the pictures I see of her, she is always smiling; always happy. She teaches me a lesson or two daily about life. I continue to prayer for her and strength for the rest of her family. It is great to see such a beautiful smile always on Emily's face! She is a doll. Just wanted to say I am excited to see that the hat fits her, I hope she is enjoying them both! I think we should ALL write on JB Facebook and tweet him about emily! I am thinking of you. You are a strong woman and so is Emily. My heart goes to you and I pray everything changes soon. Your family is beautiful and I can not image how hard this is or how strong you must be to be able to write about this and increase our awareness.